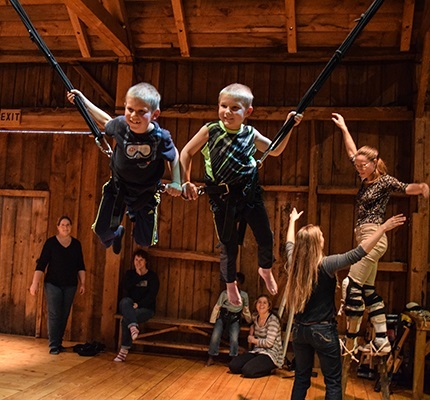 In 1994, Stacy Klein moved her adventurous company, Double Edge Theatre, from Boston to a former dairy farm in rural Ashfield, and started milking the Muse. A quarter-century later, the 100-acre spread is home to a resident company of artists and a hub of visceral, imagistic, movement-based exploration and performance. 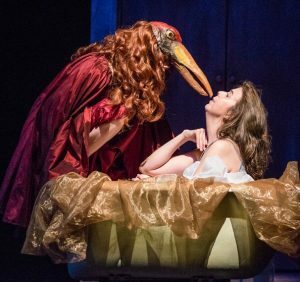 It took a few years for the locals to get used to the presence of artsy types on the edge of their village, but now the theater is largely welcomed as an active part of the community. That connection is reinforced with events that invite the people from the town, and beyond, to visit and explore with the company. This year’s 25th-anniversary celebration begins, this weekend and next, with a revival of the company’s signature piece in its Latin American Cycle, Leonora & Alejandro: La Maga y el Maestro. 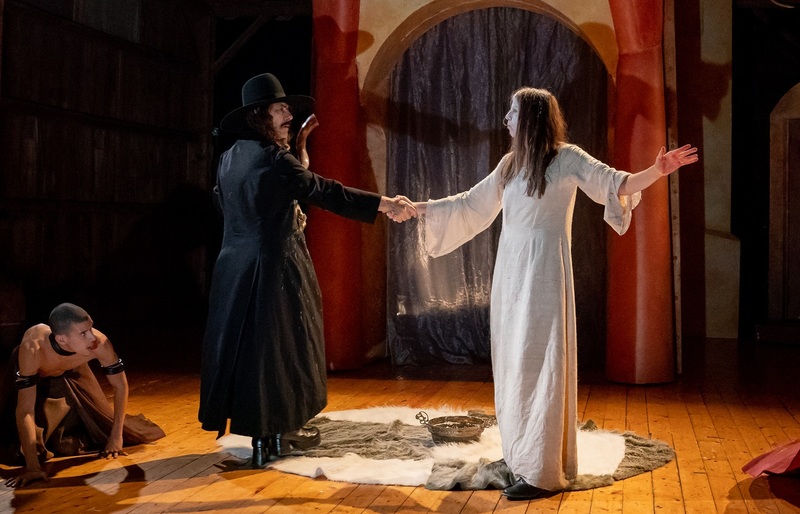 The intimate indoor piece, conceived and directed by Klein, is drawn from the art and life of the free-spirited Anglo-Mexican artist/feminist/mystic Leonora Carrington and her year-long relationship with the Chilean-Jewish filmmaker and writer Alejandro Jodorowsky, who sought her out, looking for mentorship. Their collaboration culminated in a performance called Penelope. 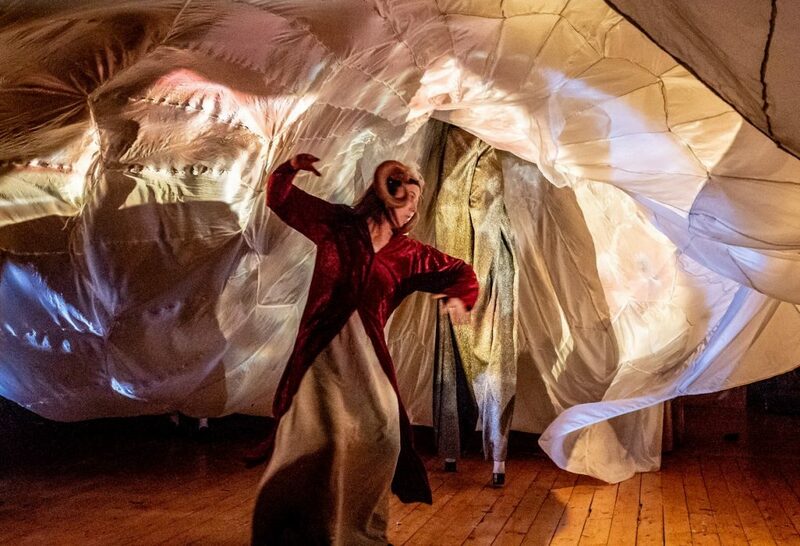 “In their world,” the Double Edge description states, “the boundary between life and work, dream and reality is permeable, with only a thin veil separating the physical and spiritual realms.” The “surreal performance” of Leonora & Alejandro “is steeped in magic, inhabited by otherworldly creatures, and reveals not only the alchemical melding between great seers but also their spiritual tug of war around issues of gender.” Company members Jennifer Johnson and Carlos Uriona take the title roles. On Sunday the 14th at 1 p.m. there’s a related symposium, Women and Magic, “a discussion on women’s alchemical, magical, and spiritual creation process” with a panel of women artists and scholars ($20 including a shared meal). Leonora & Alejandro, April 5-7 & 12-14, 7 p.m., Double Edge Farm Center, Ashfield. Tickets $30-$45 (special rates for Ashfield residents) at doubledgetheatre.org.